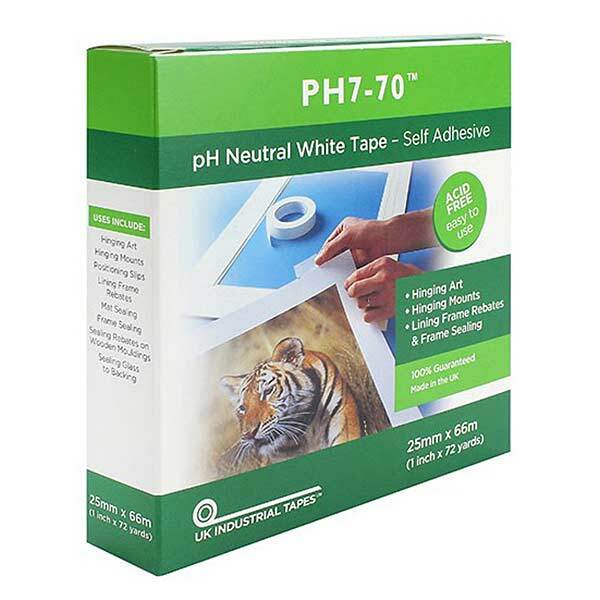 Self Adhesive pH7-70 Conservation Mounting and Hinging Tape (boxed). Single sticky sided ph-neutral (acid free acrylic adhesive) conservation (archival) tape for hinging artwork to the picture, photo or art mount. This tape will not cause browning of artwork and is conservation grade with excellent ageing qualities. High quality 70gsm, self wound (no backing to remove), and works with a variety of paper textures. Size: 25mm wide by 66m length.